Memorial Day is about remembering and thanking those who’ve lost their lives in the name of the United States, and we here at PSH would like to contribute. In World War I, in World War II, in Korea and in Vietnam, many former and active major league baseball players served in the armed forces. While many served, only a few professional ballplayers died; the first of which spent 4 seasons as a third baseman with the Phillies. Eddie Grant was born in 1883 in Massachusetts and graduated from Harvard, giving him the nickname “Harvard Eddie.” He broke into the majors in 1905 with the Cleveland Naps. 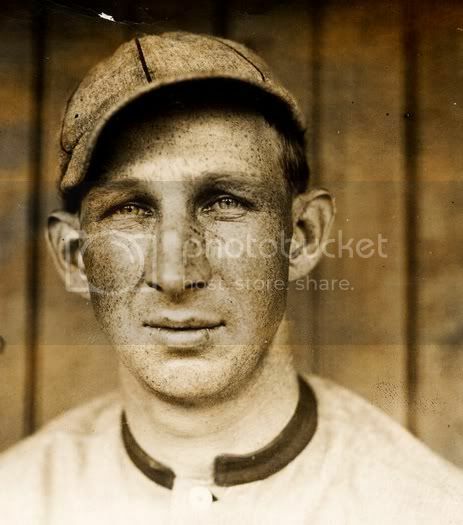 After a year in the minors with the Jersey City Skeeters, Grant was signed by the Phillies in 1907. He played 74 games that season, batting .243 and stealing 10 bases. 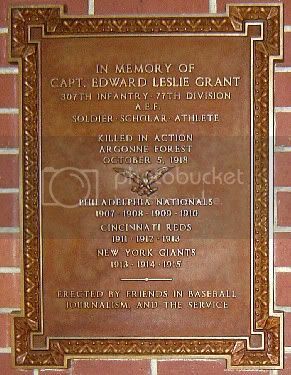 From 1908 to 1910, Grant started at third base for the Phillies and batted leadoff. His best year was 1909, in which the light-hitting infielder batted .269, scored 75 runs and stole 28 bases. The educated Grant was somewhat of a grammar nerd on the field: he would not yell the accepted “I got it” when pop-ups were hit his way, instead opting for the grammatically correct “I have it.” After his years with the Phillies, Grant finished his 10-year professional career with the Cincinnati Reds and the New York Giants and retired after the 1915 season. After baseball, Grant returned to Massachusetts to practice law. By this time, World War I had been raging in Europe for three years and many of Grant’s Harvard classmates were volunteering their services just behind the trenches even though the U.S. wasn’t officially involved. When the U.S. did enter the war in April 1917, Eddie Grant was one of the first men to enlist. As a college-educated man, he was appointed Captain of Company H of the 307th Infantry Regiment of the 77th Division of the American Expeditionary Forces. Deployed to the Western Front, Grant’s battalion fought in the Meuse-Argonne Offensive in France. This was one of the fiercest offensives in American military history as the U.S. forces battled through the Argonne forest, which housed entrenched and experienced German forces. During the offensive, a group of men became pinned down by the Germans and isolated from the American forces. U.S. aviators were sent to locate the “Lost Batallion” and finally did. Even though his Company had been fighting on the front lines for 4 straight days, Grant led his men into the forest to rescue the Lost Battalion. Pounded heavily by German artillery, the U.S. Forces and Allies were taking a lot of losses. One of the wounded being brought back past the troops advancing to the location of the Lost Battalion was the commander of the Grant’s battalion. He recognized Grant and informed him that all of the superior officers were either killed or wounded; Eddie Grant was now in charge of a battalion. As he led his battalion closer to the isolated Americans, the German shelling increased. As Grant and some of his officers were being briefed, a German shell exploded near them and killed two lieutenants. Grant was yelling orders for his men to take cover and for medics when another shell exploded just above him and he died instantly. He was buried in the Argonne forest just a few yards from where he was killed. 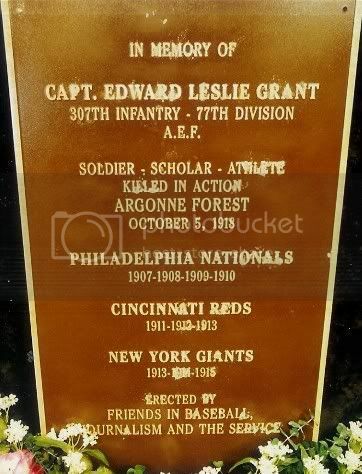 The Giants commemorated Eddie Grant’s sacrifice by installing the plaque pictured above at Polo Grounds and placing a wreath around its base every Memorial Day. 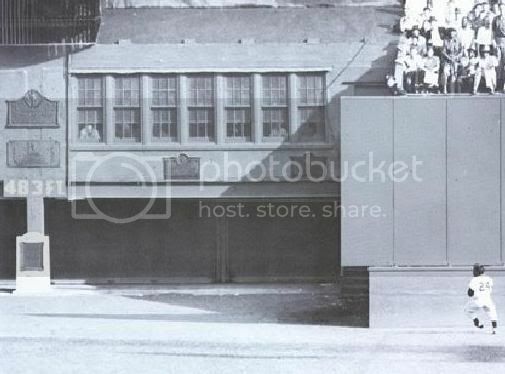 (You can see the plaque in it’s position at Polo Grounds here. It’s just below the 483 ft. sign, and yes, that’s a photo of the Willie Mays’ catch). After the last game at the Polo Grounds, the plaque was stolen when fans tore up the stadium taking every souvenir they could. It popped up a few years later, but was then lost for good. When the franchise moved to San Francisco, a replacement plaque was not installed until 2006 after multiple requests for the Giants to do so. He fought for Liberty—and died. 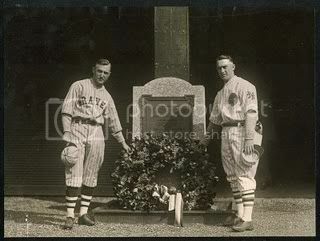 *In addition to Grant, two other major leaguers were killed in WWI: Tigers’ pitcher Robert Troy and Yankees’ outfielder Alex Barr. Also, Hall of Fame pitcher Christy Mathewson suffered gas poisoning during the war which led to tuberculosis and his ultimate death in 1925. In WWII, 50 former or active professional players lost their lives. Of the 50, two were ex-major leaguers: catcher Harry O’Neill, who died on Iwo Jima, and outfielder Elmer Gadeon, who was killed in France. Only one former major league baseball player was killed in Korea: shortstop Bob Neighbors. No former or active major leaguers were killed in Vietnam, or any subsequent conflicts.